zombies wearing helmets: Pop Tarts and Lovecraft and cross stitch! Oh my! Eating before bed gives me nightmares. Eating a lot before bed gives me a lot of nightmares, and I found that out the hard way earlier this week. I was feeling snackish one night, so I ate two chocolate Pop Tarts. Then an entire bag of popcorn smothered in melted butter and salt & vinegar spice. And then four more chocolate Pop Tarts. (Yup, you added that up right. Six chocolate Pop Tarts.) It all definitely falls into the it-seemed-like-a-good-idea-at-the-time category. So, of course, I had oodles of weird nightmares and woke up a bunch of times throughout the night. Also, it probably didn't help that I read a few stories by H. P. Lovecraft before I went to sleep. I'm reasonably sure that Cthulhu didn't actually make an appearance though. Of course, that would have been down right cheery compared to some of the creepy silliness that my brain came up with. 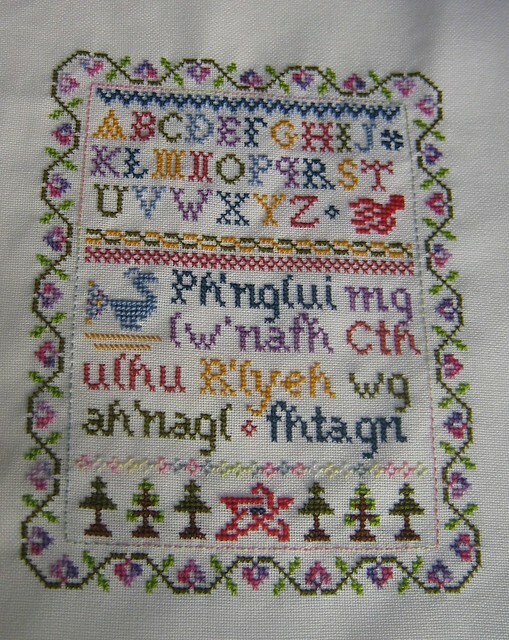 And how awesome is this cross stitched sampler anyway?